Unvented hot water cylinders made from Duplex Stainless Steel for use with dairy farm robotic milking systems. 2 x 3kw single phase immersion heaters to give fast reheat times. In hard water areas it is strongly recommended that a water conditioner / water strainer be installed alongside the water heater. We offer two systems for scale control which can be seen here. Failure to protect the water heater from the effects of limescale deposit will invalidate the Warranty. 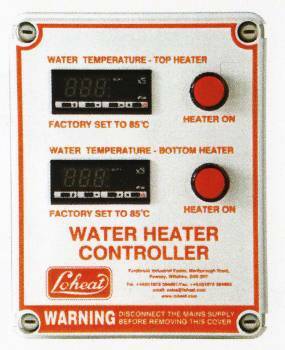 Click here to be taken to our secure site to purchase your Loheat Robotic Milking System Water Heater online. You can also phone, fax or skype your order through to us. For standard Water Heaters, we can usually supply within seven working days from receipt of order.